Cost: $14.99 per deck, plus shipping and tax (Ohio only). Card backs can be customized with your logo and colors in quantities of 500 or more decks. 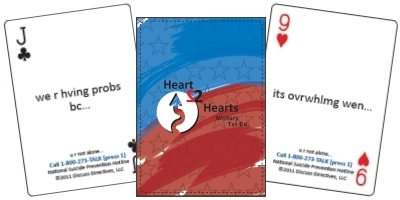 This is the same card content as the Army Edition, but with a different design. 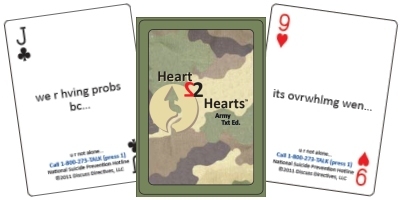 This is the same card content as the Army Txt Ed., but with a different design. 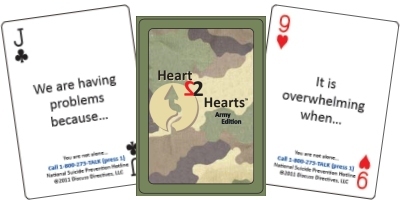 See other editions of Heart2Hearts®. "... produces high quality results despite deadline pressure. 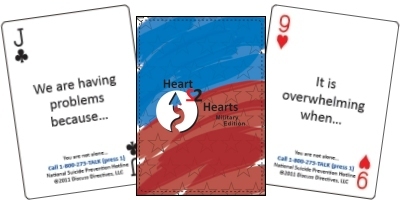 "...an incredible tool, this deck of cards opens the door for helpful and healing conversations." "Lisa Newburger is a consummate mental health professional AND a very engaging stage personality! Her powerful content and innovative approach to suicide prevention will do much to turn back a tragic trend that is debilitating America's finest—the men and women who serve or have served in uniform. " Heart2Hearts is a helpful tool in addition to traditional means of assessing mood disorders and suicidal thoughts. Often, my patients would state noting a problem in their life but not being able to express in words what it is. The cards gave them a chance to better express their thoughts. It is a helpful adjunct along with mood disorder screening tools; I recommend it for primary care providers who want an additional resource for these matters.